If you are traveling in France and want to save a few euros, then camping is a great option just like in the United States. Your camping options are quite varied – from unique lodging like gypsy caravans to cabins to your own tent. 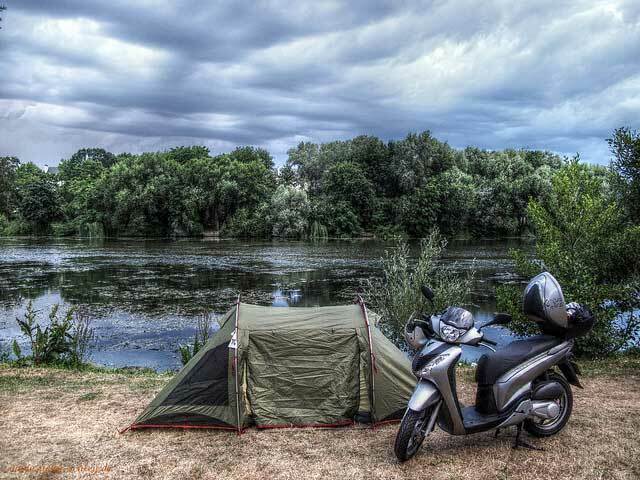 Of course, the cheapest options for camping in France is with your own tent. When you start planning your camping trip, an excellent resource is the CampingFrance.com website, which lists 11,000 campsites in the country. And if you’ve never camped in the country before, then you’ll want to get yourself a camping carnet. Officially, this is called an CCI or Camping Card International. This card serves several purposes. You can use it as a form of identification at campsites. It gets you a discount at many campsites. It gets you advance reservations at some sites and even waives the deposit at some campgrounds in France and the rest of Europe. To get one of these cards, refer to this list to determine where to buy it based on your home country. The price for the card varies by country, but is cheap. Once you get a CCI, the card is valid for a period of 12 months. Once you get your CCI squared away, you can use the Camping France website to find a campsite at your preferred destination. The site gives all the official campsites in the country, as well as a list of amenities offered at each location. If you’re from the U.S., then you’ll notice that French campgrounds often offer more amenities than those in the U.S. like large pools with slides. Another thing about camping in France that might surprise you is that many of the campgrounds have nice restaurants on-site. This is a great way to get some delicious French cuisine at a low price. Campgrounds in France do get a start rating by the government, with 4-stars being the best rating. If you go with a 3-star or 4-star campground, then you can rest assured that you are pitching your tent at a nice site. Some of the 4-star locations border on luxury in terms of amenities. For a good write-up on staying a no-frills 2-star campground, take a look at this Telegraph article. If you will only be staying at campground for a short stay, be sure to have cash with you to pay the campsite fee and many campgrounds in France do not accept credit cards for single night stays. And if your travels will be during peak season, then try to secure an advance reservation since camping is very popular in Europe. Overall, camping with your own tent in France should be a stress-free experience that offers you a great budget vacation. It will be similar to pitching a tent in the U.S., expect you’ll have easy access to the best croissants in the world. For an idea of what to expect at French campsites, check out the video below.